– a workshop hosted by the Google Earth Outreach team. The 4-day intensive workshop gives these do-gooder techies hands-on technical training with Google mapping tools and guidance with their projects. Out of the 75 participating organizations this year, there are some truly amazing stories to tell. One of the attendees, Devin Dotson, is from the nonprofit American Rivers, focused on protecting and restoring the rivers of the United States. 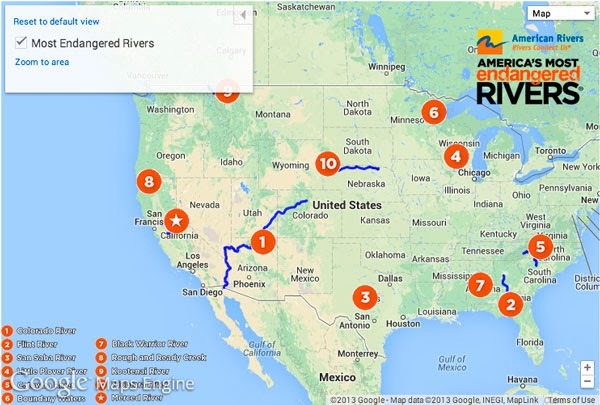 American Rivers uses maps to help tell the story of river conservation across the nation. Most recently, American Rivers made their annual announcement of the 10 rivers that are America’s Most Endangered Rivers in 2013. To illustrate these rivers, they released this map in the Google Earth Gallery, built using a Google Maps Engine software grant. 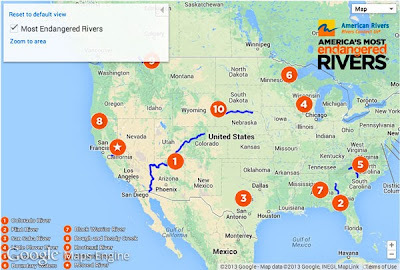 The map allows the public to explore the map of the rivers and learn more about how to get involved by clicking each river. Another Geo for Good participant is Lilian Pintea from the Jane Goodall Institute (JGI). Lilian will be sharing JGI’s story about how they’ve used mapping technology on mobile devices to monitor chimpanzee populations, habitats and human threats with local communities in Tanzania. Using this data, JGI is able to engage local communities in protecting chimpanzees and share real-time information with the world through dynamic web maps using App Engine, Fusion Tables, Google Maps API, and Open Data Kit (ODK). Returning to the Summit from last year is Daniel Orellana, representing the Charles Darwin Foundation. 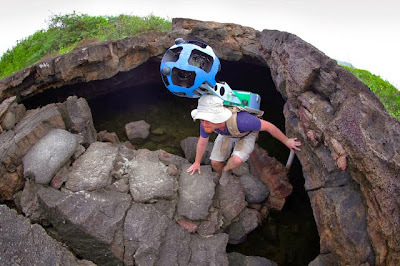 It was during last year’s Summit that Daniel was inspired to suggest that Charles Darwin Foundation work with Google Earth Outreach to bring Street View to the Galapagos. Since the imagery was launched in September, the Charles Darwin Foundation has been working on projects to use the images for science, conservation and education. One of these projects is Darwin for a Day, which allows the public to help identify plants and animals observed when navigating through the imagery. To learn about Google Earth Outreach and how you can use maps to make the world a better place, head to the Google Earth Outreach website. To find out about next year’s Geo for Good or other mapping workshops, follow Google Earth Outreach on Twitter. This week, we are excited to welcome this year’s group of nonprofit mapping specialists to the annual Geo for Good User Summit – a workshop hosted by the Google Earth Outreach team. The 4-day intensive workshop gives these do-gooder techies hands-on technical training with Google mapping tools and guidance with their projects. Out of the 75 participating organizations this year, there are some truly amazing stories to tell.